Miva Merchant's Reserved Seat allows you to allocate a seat to a single user and ensure that user will always have access to Miva. The Reserved Seat was designed to be used by external systems and API integrations that need to ensure they never get locked out and always have a seat available no matter how many others are logged in. Example systems would include Miva Synchro, ShipWorks and Stone Edge among others. It is recommended that each critical external system that needs to access Miva (to push and pull data) have its own reserved seat. 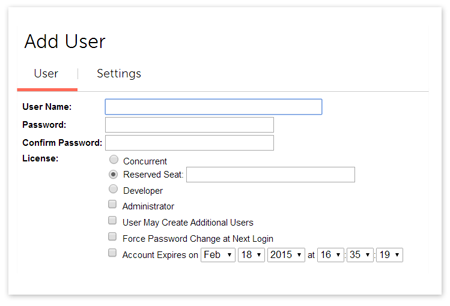 When creating a new user from the Miva Merchant admin, there is now the ability to choose a license type. Selecting the "Reserved Seat" option will cause this user to allocated as a Reserved Seat and always connect to Miva Merchant. Each reserved seat you purchase will come with its own license, which must be entered at the time you create the user. Reserved Seats can be purchased for $50/seat per month. To signup and request a Reserve Seat License, please click the link below.